Well, this is interesting. 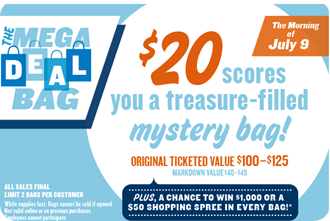 On Saturday, you will be able to purchase a $20 mystery bag at your local Old Navy. This "treasure-filled" bag will contain items that were originally $100-$125 ticketed value (marked down $40-$45). Plus with every bag you'll get a chance to win $1,000 or a shopping spree! Sounds like fun, right? This special will be in-store only and will only be available during the morning of July 9th, so be sure to get there early! Oh man! I'm going to miss this. We went to Old Navy yesterday! It would have if the nearest Old Navy was closer than an hour away!